Dr. Vincent Heng-Chen Chao is currently Professor of Violin at the National Chiayi University in Taiwan. An outstanding violinist and pedagogue of international renown, Dr. Chao has given recitals and chamber music performances at venues such as the Library of Congress of DC, Suntory Hall of Japan, and National Concert and Recital Halls of Taipei, among others. Prior to his return to Taiwan, he had served as the Concertmaster of the Maryland Symphony Orchestra in the USA. His past students have won many local and international prizes, including top prizes at the Menuhin competition, Michael Hill competition, and Taiwan national competitions. Moreover, several students have won positions at the Hong Kong Philharmonic, Macau Philharmonic, National Taiwan Symphony Orchestra, among other professional orchestras in China. Dr. Chao also kept an excellent track of sending advanced students to prestigious music schools such as Curtis, Juilliard, New England Conservatory, among other fine European conservatories on the yearly basis. 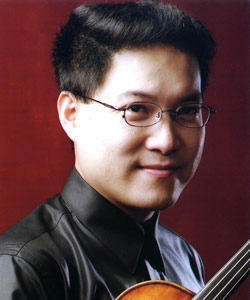 A specialist in chamber music and orchestral performance, Dr. Chao was invited and participated in many world-leading festivals such as the Tanglewood, National Orchestral Institute, Heifetz International Music Institute of the USA, Pacific Music Festival of Japan, and Schleswig-Holstein Festival of Germany. Dr. Chao received his advanced training mostly in the USA. His principal teachers include some of the greatest artists of our time such as Daniel Heifetz, James Buswell, Arnold Steinhardt, Michael Tree, and John Daley of the Guarneri Quartet, Prof. Margaret Pardee and Dr. Tyrone Greive, etc., earning Master of Music degree from the Juilliard School, and finally leading to the Doctor of Musical Arts degree at the University of Maryland-College Park.